Myopia with power up to −8.00 diopters is low myopia. This has only mildly effect on ocular wellness. Prolonged untreated low myopia can cause chronic eye strain, retinal tears, glaucoma, headaches, and sensitivity to light. The risk of retinal detachment increases with the worse form of low myopia. The power of low myopia does not progress after the age of 21. The low myopia mainly results from environmental factors and there occurs a correlation failure of refractive power of lens and retina. This type of myopia usually get stabilizes with the growth. Treatment: The low myopia control is done by corrective eye glasses or contacts lenses. Laser procedures or radial keratotomy (RA) can be done at about 18-21years when the power becomes stable. But the disadvantage of laser treatment is that, it may cause dense scars in some individuals. This central scarring can cause blurred vision permanently. Whereas in radial keratotomy the central area remains clear. What is very high myopia? 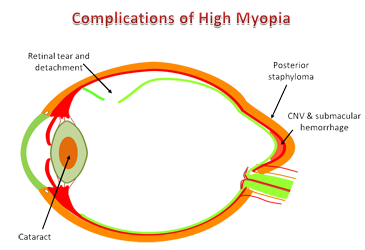 High myopia is a chronic, degenerative condition, sometimes referred to as pathological myopia or degenerative myopia. It is a very serious condition of extreme myopia that causes profound alteration of the shape of the eye, eventually leading to near vision loss. Short sight of −8.00D or more is regarded as high myopia; it can go up to -20D. The chance of retinal detachment and primary open angle glaucoma are prominent in a high myopic eye. 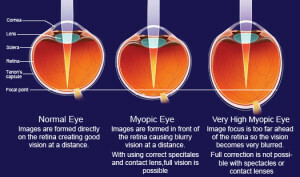 In high myopia vision, floaters or shadow-like bodies are experienced in the field of vision. The high myopia progresses from childhood to old age. About 30% of nearsighted has high myopia at birth. Some of the common symptoms of high myopia include headache, squinting, eye strain and eye tiredness. An ethnic difference also noted in the incidence of high myopia. Asian population is more susceptible to high myopia than others. The causes for high short sightedness are either the elongation of the eyeballs, or the stretching and thinning of the retina and sclera, eventually leads to bulging of posterior part of the eye, called staphyloma. The deformation of the eye can cause strain on the retina which eventually gets damaged and provoke other changes that can lead to problem with vision or loss of vision. Tears or openings in the retina due to high shortsightedness makes the retina loose or detach from the rest of the eye. A detached retina can cause irreversible blindness if not treated promptly. The retinal detachment occurs as a complication of high myopia. Other complications include, complicated cataract, degenerative changes, and amblyopia. Myopia in children is a serious degenerative eye condition. The babies of highly shortsighted parents are more prone to develop high myopia i.e. heredity accounts for 5-7% of high myopia in children. There are a number of environmental factors involved in the development of high myopia. The increased susceptibility to eye myopia is observed in prematurely born children. The sooner they are born before the full term of pregnancy, the higher the chance of myopia. The probable reason is that their eyes are forced to function in spite of being not completely developed. Low birth weight is another important factor which predisposes the high myopia. Just like nutrition is an important factor during the growth of babies, the eyes also needs nutrients to develop. DHA present in human breast is a major factor involved the development of healthy eye. Inadequate breast feeding due to busy lifestyle may be a reason for the increased cases of myopia these days. Incidences of high myopia are more in children who grow rapidly than normal. Maternal alcoholism, prolonged illness with fever, congenital infection with Toxoplasma, Rubella, and toxaemias are the other factors influencing high myopia. A rural urban difference also noted in the incidence of high myopia. High myopia is more common in urban areas compared to urban areas. The exact reason for this is not known but could be due to the life style changes and inadequate breast feeding. The child’s performance in school is badly affected by severe myopia symptoms. The general complications associated with high myopia in children are difficulty in seeing the writing board, difficulty in reading text, light sensitivity, and headaches. It’s crucial to provide emotional and mental support to children in addition to the medical support. How to treat myopia? Treatment for nearsightedness only addresses the symptoms. Correction with eye glasses: The strong glasses for myopia correct the focus error in this refractive problem. These glasses are extremely thick and heavy. But these strong eyeglasses glasses for nearsightedness negatively affect the off-axis viewing of objects away from the centre of the lens, eventually results in chromatic aberration by the prismatic movement and separation of colours. Colour fringes are viewed around strongly contrasting colours. Correction with contact lenses: The preferred method of correction is by using contact lenses, as the lens move with the cornea and always stay centered with the gaze. This can avoid the use of thick and heavy glasses. Implantable contact lenses are also found to be promising for high myopia treatment. Additional refractive problems, such as astigmatism, or curvature of the eye, can also be corrected in the same way. Patients usually report having better vision when wearing contact lenses. These lenses eliminate the problems that the eyewear causes. Correction with laser surgery: Photorefractive keratectomy (PRK) and laser assisted in-situ keratomileusis (LASIK) are two similar surgical techniques that are used for the treatment of myopia by reshaping the cornea using an excimer laser. LASIK surgery is effective for low order myopia.